As you probably know, the Pattern System consists of patterns, wounds, and healthy capacities. Capacities are what make our lives work well and help us to feel good. They are the goals for therapy and personal growth work. In each dimension of the Pattern System, there are two (or more) patterns and two (or more) capacities. The capacity on the opposite side from the pattern is the one that you are aiming to replace that pattern. Let’s look at the Inner Critic Dimension Group for examples. 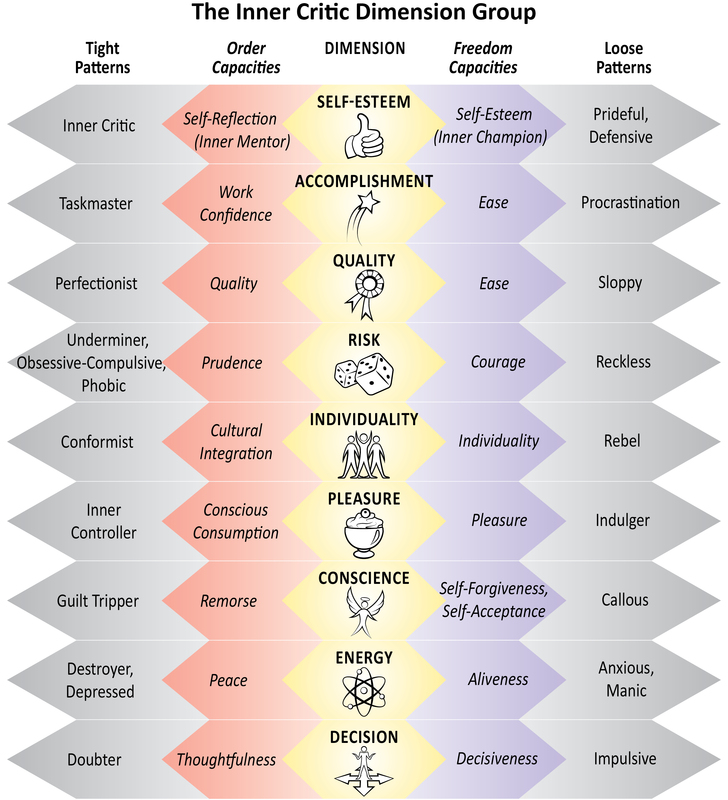 Looking at the top dimension, the Self-Esteem Dimension, on the left side is the Inner Critic Pattern and on the right side (closer in to the middle) is the Self-Esteem Capacity. (I will explain the Inner Champions and Mentors in a later class.) The Self-Esteem Capacity is what helps to transform the Inner Critic Pattern and is also what ideally replaces it as you completely transform your Inner Critic. Similarly, the Ease Capacity is what replaces the Taskmaster Pattern; Ease also replaces the Perfectionist. As you work through and transform your Taskmaster or Perfectionist, you develop Ease. Courage replaces the Underminer. Pleasure replaces the Inner Controller (Food Controller), and Aliveness replaces the Destroyer. Each of these capacities is explained in detail in STJ. Healthy capacities are very useful because they show you where you are headed with your therapy. You aren’t just trying to transform your Inner Critic; you are aiming to develop Self-Esteem. This provides inspiration and hope. It also allows you to focus on the positive. Healthy capacities are also an important aspect of Stage 5, where you will be setting up a real-time practice to evoke Self-Esteem (or one of the other capacities instead of your Inner Critic) in a practice situation that you choose in your life.